The 85 Ways to Tie a Tie (ISBN 1-84115-249-8), by Thomas Fink and Yong Mao, was published by Fourth Estate on Nov 4, 1999, and subsequently published in nine other languages. 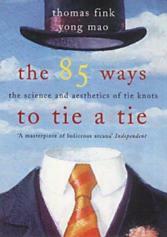 'The 85 Ways to Tie a Tie' is about the history of the knotted neckcloth, the modern necktie, and how to tie both. It is based on two mathematics papers published by the same authors in the journal Nature and Physica D. The authors prove there are exactly 85 ways of tying a necktie and enumerate them. Of the 85, 13 stand out: the four traditional knots (the four-in-hand, Pratt, half-Windsor and Windsor) and nine others, which the authors name. The discovery of all possible ways to tie a tie depends on a mathematical formulation of the act of tying a tie. In their papers (which are technical) and book (which is for the layman, apart from an appendix), the authors show that necktie knots are equivalent to persistent random walks on a triangular lattice, with some constraints on how the walks begin and end. Thus enumerating tie knots of n moves is equivalent to enumerating walks of n steps. Imposing the conditions of symmetry and balance reduces the 85 knots to 13 aesthetic ones. The basic idea is that tie knots can be described as a sequence of six different possible moves, although not all moves can follow each other. Moreover, there are two ways of beginning a tie knot, and two ways of ending a tie knot. These are summarized as follows. L = left; C = centre; R = right. i = into the page; o = out of the page. T = through the loop just made. Above: The two ways of starting a tie knot. Above: The six tie knot moves. Above: The two ways of finishing a tie knot. With this shorthand, traditional and new knots can be compactly expressed as below. The thirteen useful knots (out of 85 total) described in the book, in order of size, are as follows. The knots are sometimes designated by their number alone, e.g., FM2 for the four-in-hand (FM stands for Fink-Mao). The book was reviewed in Nature, The Daily Telegraph, The Guardian, GQ, Physics World, and others. ↑ Fink, Thomas M.; and Yong Mao (1999). "Designing tie knots by random walks". Nature 398: 31–32. doi:10.1038/17938. ↑ Buck, Gregory (2000). "Why not knot right?". Nature 403: 362. doi:10.1038/35000270. This page was last edited on 6 May 2012, at 13:48.